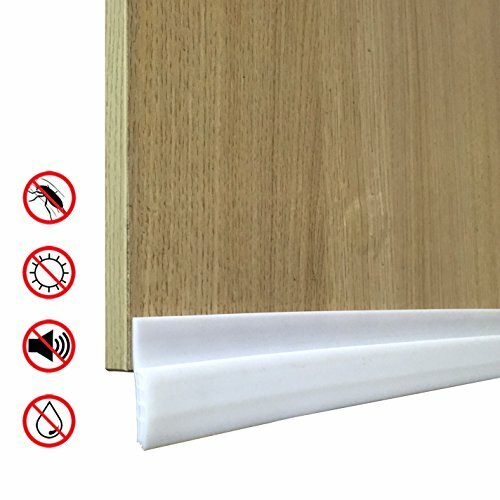 ★Door Reliable Friends★-Help your door block noise, pest, warm, insects, water, cold away. Your door must be happy make friend with our door under seal. ★Easy install★--Clean the door before install. Tear off red cover, stick and press the door bottom(Important!, press seal with Acrylic Adhesive can increase sticky), Cut the extra length. ★Enough length★--Door Under Seal measure 39\" length, longer than most door; 2\" width, advise measure door, better use off ground 0~2\". ★Premium silicone★--Made of 0.23\" thick silicone. 3 layers design help anti-noise pest, hot. Harder than normal silica gel with Long life, however, it won\'t harm your floor, use free. ★100% Satisfy Guarantee★--We have a no-questions-asked 100% refund guarantee! If there are any problems or recommendation, please contact us, we are waiting for your sounds and will reply to you as soon as possible. A great way to reduce your electric bill!